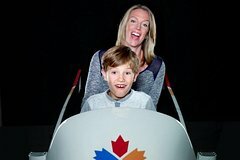 Visit Canada's only Olympic museum and experience sports like never before. The Olympic experience features galleries of historic artifacts from past Olympic Games and interactive virtual reality sport simulators to let you feel what the athletes feel. Admission includes tickets to the short feature film "Pursuit of a Dream" and access to the Richmond Olympic Oval, an award-winning multi-sport complex and one of the most iconic Olympic sport facilities ever built. As you walk through the doors of the Richmond Olympic Oval, you can feel that you are walking into a special building. Show your ticket to the front counter staff who will guide you to the Olympic Experience Theatre, where you will watch a 9-minute short film titled "Pursuit of a Dream." From there, explore the second floor exhibits and field of play before heading up to the 3rd level interactive exhibits. Tours are self-guided, or you may ask one of the friendly Olympic Experience volunteers to give you a tour. The O Cafe is available for your convenience, serving delicious West Coast Canada cuisine. There is no food or drink allowed in the exhibit areas. With your day admission to the Olympic Experience, you get full access to the world class amenities of the Richmond Olympic Oval. This includes indoor rock climbing, ice skating, outdoor beach volleyball, fitness gym, and sport courts. Visit www.richmondoval.ca/drop-in to see the facility schedule and plan your visit.